Geese were traditionally harvested when they were the fattest, toward the end of the year and in time for the holidays. Fat is essential for good meat flavor, and rendered goose fat makes a delicious shortening. Any goose breed is suitable to raise for meat, although the different breeds vary in size. You may want to take into consideration the size of the grown goose in relation the number of people you plan to serve, as well as the sizes of your refrigerator, freezer and oven. Once a goose is dressed and ready for the oven, store it, loosely covered, in the coldest part of the refrigerator for no more than three days, or wrap it well and freeze it. 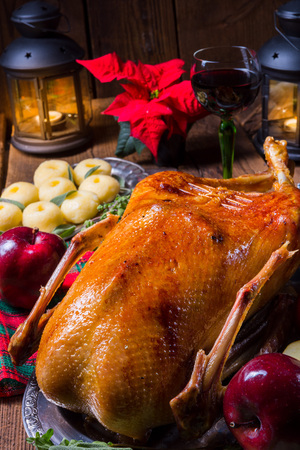 Thaw a frozen goose in the refrigerator, allowing two hours per pound (amounting to about 48 hours). When you’re ready to roast your goose, bring it to room temperature for 30 minutes. Mix ingredients together and stuff the goose. Fasten the neck skin to the back with a skewer and tie the legs together. Whether the goose has been stuffed or not, prick the skin (but don’t stab into the meat) all over with the tines of a meat fork so the fat will ooze out as it liquifies — sort of a self-basting process. For extra crisp and tasty skin, rub it all over with a cut lemon, sprinkle with salt and dust with a little flour. Place the goose uncovered and breast side up on a rack in a roasting pan, with a meat thermometer inserted deep into the inside thigh muscle. Roast in a preheated 400°F oven for six minutes per pound, then reduce the heat to 325°F and allow an additional 12 minutes per pound. Slow cooking keeps the meat juicy and tender. The fat under the goose’s skin that melts off during roasting may be saved by spooning it out every half hour, which keeps the fat from excessive browning. Strain off and discard solid bits, pour the rendered fat into a jar, and store it in the refrigerator. Clean fat may be kept in the refrigerator for a long time — as much as a year — but is so good you will probably use it up long before then. It may be used wherever you might otherwise use butter, shortening, lard, or bacon drippings. Your goose is cooked when the thermometer reaches a temperature of 165°F. If you have no thermometer, you can test for doneness by pressing the meaty portion of the leg between protected fingers; it should feel soft. Then prick the thigh with a fork; the juices running out should be clear, not be pink. The skin should be golden and crisp. The trick to learning how to roast a goose is to realize that, unlike the white meat of chicken and turkey, goose meat is red. When you cut into the breast, it should be pink. Take care not to overcook, which destroys the texture and flavor of goose meat. Skim the final pan drippings and make them into a delicious gravy to serve over the sliced goose meat, biscuits, potatoes or stuffing. Arrange the finished goose on a large platter surrounded by sweet potatoes, baked apples or other favorite trimmings, and be prepared for the “oohs” and “aahs” as you arrive at the dinner table with your homegrown roasted goose. Gail Damerow is editor and principal author of Backyard Homestead Guide to Raising Farm Animals. ← Can You Stop a Rooster From Crowing? thichdaga.com on What In the World Is That Weird Thing Called a Lash Egg? Mother Hen on What Do You Call the Place Where You Keep Your Chickens?